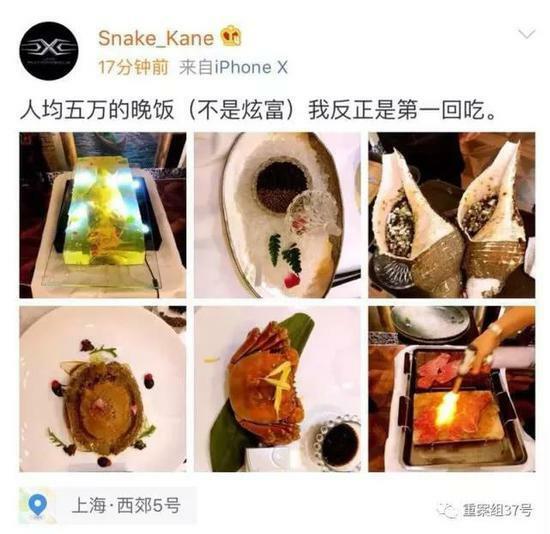 A dinner bill of more than 400,000 yuan (S$79,733) for eight people at a Shanghai restaurant has aroused extensive interest online after it was posted on Sina Weibo by one of the diners on Tuesday night. Jiang Xin, the son of wealthy entrepreneur Jiang Quanlong, posted photos of the dinner and the bill on his microblog account soon after the bill was produced at around 10:20 pm on Tuesday. "Enjoy a dinner that costs 50,000 yuan each (with no intent of showing off), first time for me anyway," the microblog post said. It went viral among netizens and sparked widespread speculation about the identity of the person who paid the bill. The post was deleted on Wednesday morning. On Dianping, China's leading restaurant review app, the average cost per person at the restaurant, Maggie 5 in Shanghai's Changning district, is listed as 880 yuan. On the bill, however, dishes such as "Half Abalone Frozen in Sake" and "Crocodile Tail Stew Soup", cost more than 10,000 yuan per person. A report by Beijing News on Thursday said that when reached by phone, the owner and chief chef of the restaurant, Sun Zhaoguo, said he personally prepared the 20-course dinner, which was ordered by a prince from Dubai, and the menu was custom made. He also said all the ingredients, including abalone, wild conch shell and crocodile tail, were flown in fresh just for the banquet. Sun said Jiang did not pay the bill and refused to reveal the names of the other diners. The newspaper reported that Jiang took 480,000 yuan worth of alcohol to the dinner. The online uproar over the bill has prompted the Changning district market supervision bureau to investigate the case.